Starting on the afternoon of October 4, heavy rain and strong winds are causing safety accidents and damage to facilities. According to the Jeju Meteorological Administration today, strong winds have been reported throughout Jeju Island, heavy rain alarm has been reported on Jeju's mountainous areas, coastal area and the south areas in Jeju Island. The 25th typhoon, Kong-Rey, is moving north and south at 26 kilometers per hour on the sea about 170 kilometers northwest of Okinawa, Japan. It is expected to reach the waters about 190 kilometers south of Seogwipo by 3 p.m. tomorrow. Afterwards, the typhoon is expected to pass through the water of Northeast Dokdo to Sapporo, Japan. 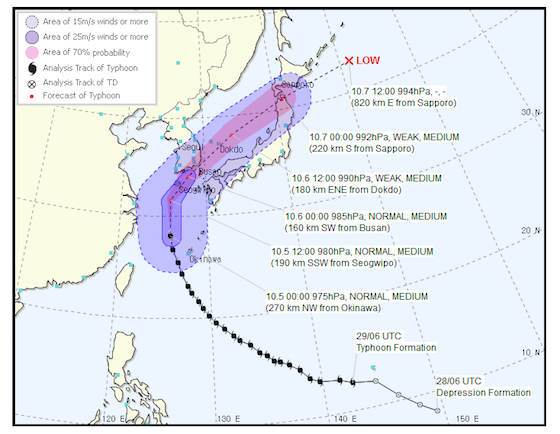 Especially, Jeju Island will have more than 100 millimeters of rain due to the effect of the typhoon. From today till tomorrow morning, the expected precipitation will be between 100mm to 300mm, and there will be more than 500mm of heavy rain in the mountains. Meanwhile, festivals and events scheduled to be held this weekend have been postponed or canceled one after another. The fourth Jeju Goma-ro Festival, which was scheduled to be held at Sinsan Park in Jeju-si from October 5 to 6, has been postponed until October 19. The Jeju Food Fair, which was scheduled to be held October May 5 to 7, has also been postponed until October 20. As the schedule of the food fair was postponed, the duration of the event was reduced from three days to two days. The Media Day event, which was scheduled to be held on October 5, has been cancelled. The 24th Seogwipo Chilsimni Festival, which was scheduled to be held at Seogwipo Jaguri Park from October 5 to 7, has been postponed until October 19 to 21.